Dakota Partners is in the process of rehabilitating the historic Judd & Root building at the corner of Allyn and High streets in Downtown Hartford into 63 one bedroom apartments over ground floor commercial space. The developer’s project page notes that tenants are expected to begin to move into the units in the summer of 2014. The above photo was taken on Wednesday, July 30th, 2014 and shows that work is well underway. Windows on the 5th and 6th floors have been replaced, as have most of the windows on the 4th floor. Zooming in on the original image, one can see studs through the windows on the 4th and 5th floors but not on the 6th. Perhaps the top level is close to ready for new Downtown residents. A call to the Dakota office seeking comment on the project’s timeline and a local contact for potential tenants was not returned. 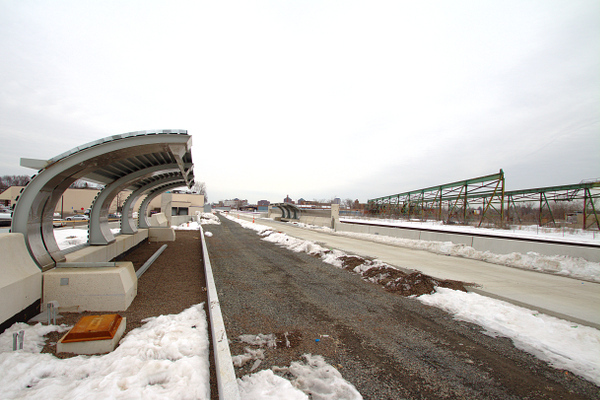 This is the current status of the Kane Street stop of the CTfastrak transit system that is under construction between Hartford and New Britain. Enough work has been completed to imagine what this station will be and how it will work. This stop will be a quick pull-off for the buses covering non-express routes, meaning they stop at each station. 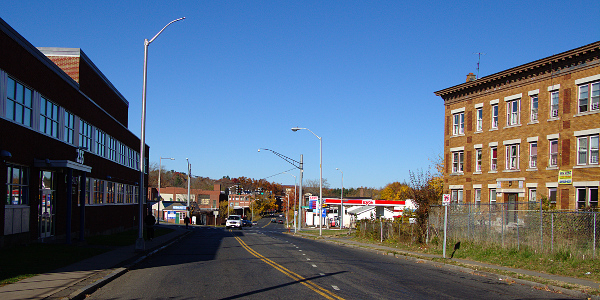 The shelter in the left foreground is for passengers on their way towards New Britain, while the shelter in the center of the image is for those waiting for the bus to Hartford. The current route map shows that the Kane Street station will also allow passengers to board buses headed towards the UConn Health Center and Westfarms Mall. I’m very interested to see what becomes of the area around the Kane Street stop. It’s an area I visit regularly, since I do my grocery shopping in the building visible on the left edge of the photo. 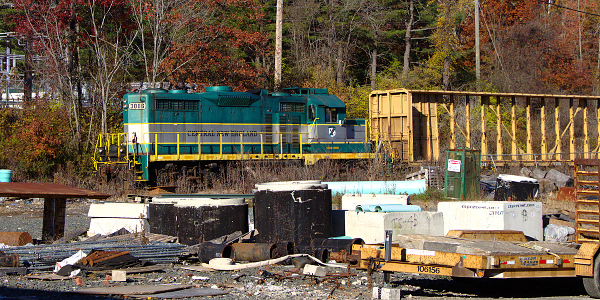 There are industrial ruins visible on the other side of the tracks (the steel structure). Looking in the other direction along the CTfastrak route there is a considerable amount of vacant land that extends under Interstate 84 all the way up to the 17 screen movie theater. 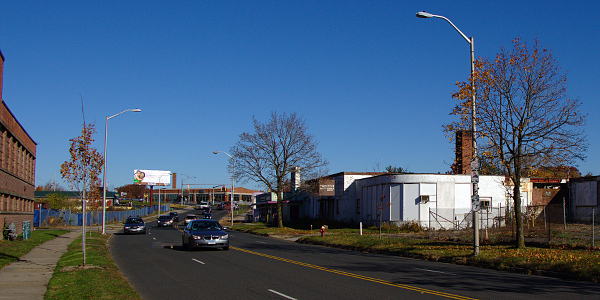 Of all the Hartford CTfastrak stops, this one seems like it holds the most potential for transit-oriented development. There are large underutilized parcels that are within walking distance of the station, that have excellent highway access and that are very near to an established grocery store. When you’re looking at a property, how much time do you spend outside looking at the surroundings? What are the adjacent properties? How do they look? Are you near a major road? Are there commercial or other non-residential parcels near you? 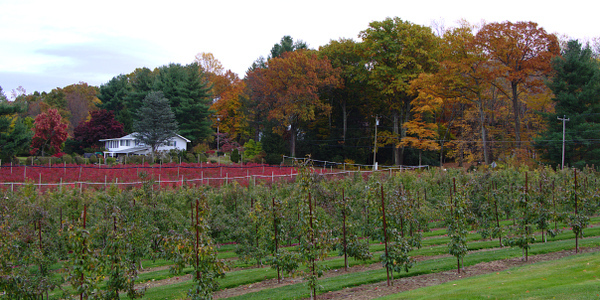 Is there a farm or undeveloped land abutting or near the property? When we view homes with buyers we try to spend some time evaluating the adjoining and nearby spaces. This isn’t necessarily to figure out if they’re going to have good neighbors or not. It’s to understand if there is the potential for change to the landscape around them. For example, a few months ago I was showing some clients property that abutted a farm. The listing agent took care to advertise that it was adjacent to the farm and used this as a selling feature because it was peaceful and scenic. But what if some day the farm isn’t a farm anymore? What if someday the farm land is sold? What does it become? Most likely residential usage, but that’s not always guaranteed. I pointed out to the buyers that the house we were looking at used to be part of the farm too, but at some point some of the farm land was sold to build this development. That could happen in the future and there could then be additional development that’s in the currently tranquil backyard. We’ve seen some examples recently of local homeowners contesting development to open land that abuts or is near their residential developments. In West Hartford, residents are speaking out against the proposed sale of 9 acres of land by the American School for the Deaf (ASD) to a home builder. In this instance, people bought houses that backed to a non-residential use property. That non-residential use property has decided to change the use of their land. They would like to sell it to a developer. But what would have happened if ASD simply expanded on their own campus? What if they grew their school and built more buildings, parking lots or playing fields on their undeveloped property? The neighboring properties would have been impacted by that as well. With a changing real estate landscape, we see these development conflicts come up all of the time. 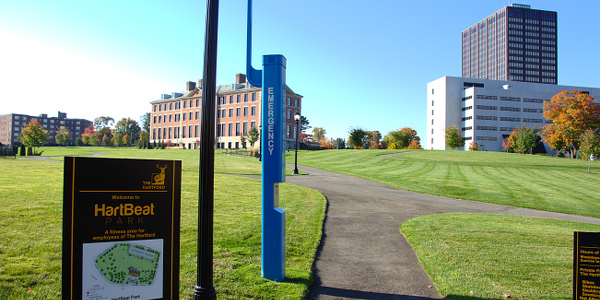 The West End of Hartford faced a similar development challenge in 2012 when the University of Hartford wanted to sell part of its campus to CREC for a new elementary school to be developed, which backed to residential development. I would expect a lot of back and forth between the Town of West Hartford and the University of Connecticut when UConn divests of its West Hartford campus in the upcoming months. What will become of that property, which is located in a residential area? 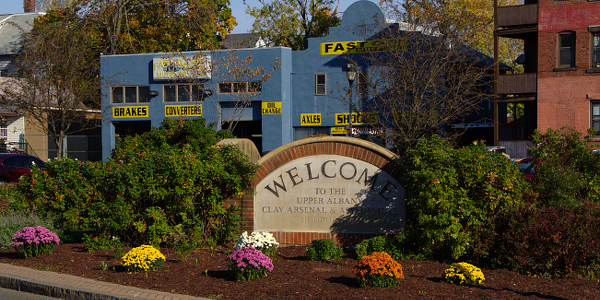 How will that change the landscape for current property owners near the campus? The point I’m trying to make here, and that we make when we’re showing buyers homes, is that what you see near here today may not be the same down the line. Some properties face more opportunities of a changing landscape than others. The change in landscape around you may actually help your property values. They aren’t always a negative. Think of what Blue Back Square has done to help West Hartford Center- there was a positive impact on residential property values in the Center because of it. That being said, it’s important to be aware of the possibility of change because not all change will be viewed as positive. Don’t just focus on the interior of a property, spend some time thinking about the outside and its surroundings. 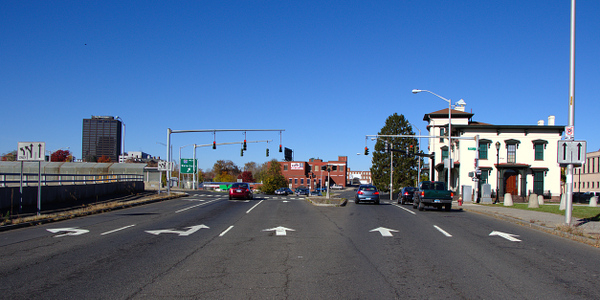 The first thing I learned about central Connecticut was that all roads lead to Hartford; literally. I was out at UConn Storrs for a summer program during college. When I looked at the map to try to figure out how to get somewhere, anywhere really, it appeared as though all the major roads radiated from the City of Hartford like the spokes of a wheel. The City itself is set up the same way – all the roads begin Downtown and fan out in each direction. 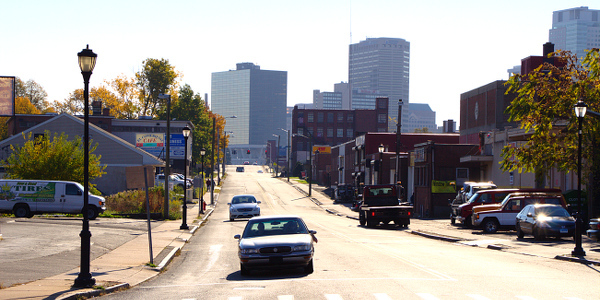 I like to explore, and today we’re travelling the Walnut/Homestead corridor, which connects Downtown with the northwest portion of the City. It is easy to miss Walnut Street if you’re not looking for it. Standing here, in the middle of Chapel Street North and looking west, it is one of the options for going straight – the right two lanes. There are no signs suggesting that this is an interesting direction to travel, but in fact it is the shortest route to get from Downtown to the intersection of Route 44 (Albany Ave) and Route 189 (Bloomfield Ave) in the top left corner of the City. So if you’re going to places like northern West Hartford, western Bloomfield, Avon, Simsbury or beyond, then this route should be a consideration. Don’t follow the signs onto the highway … stay right and head over that bridge. 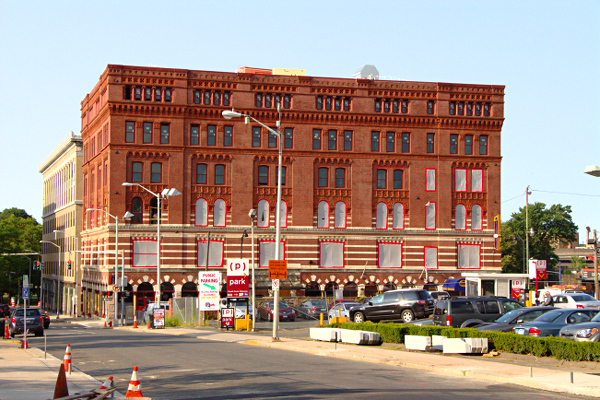 After passing the Isham-Terry House and the City of Hartford’s Public Safety Complex on your right, you will cross a bridge taking you over the rail lines – Union Station is just to the south. Looking east from the center of the bridge, back towards the City, you can see the skyline. Looking west you can see Club Charisma. I’m not current on the local club scene, so its current status is not clear to me – I wouldn’t expect it to be open at 9:30 in the morning when I was taking these photos. The tire store beyond it is definitely an active business and there continues to be two well-marked lanes in each direction. Waiting at the intersection of Edwards and Walnut, the Quirk Middle School is on the north side of Walnut. 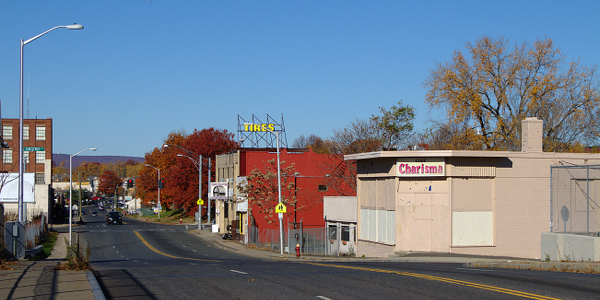 The south side is a series of commercial buildings that are mostly not in use. One of the recurring themes on this stretch of Walnut is that space is available. Call your commercial real estate agent, there are opportunities here. It’s just a couple blocks from the highway and Downtown. Continuing west on Walnut the Beacon Light & Supply Company is on the north side of the street. 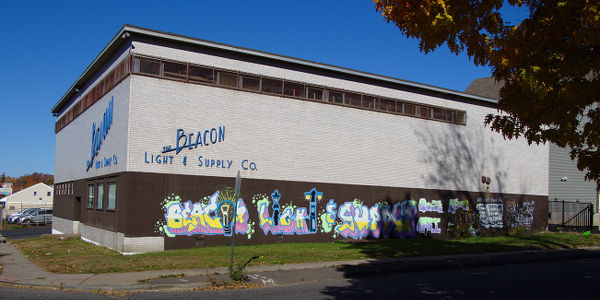 I love their mural, and had to post a picture of their building again. Walnut Street ends at Garden Street. This intersection is well done with a welcome sign, sidewalks and decorative lighting. 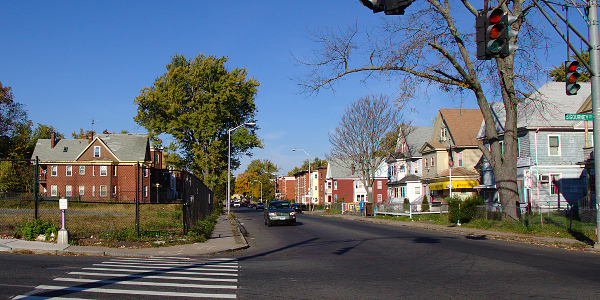 Walnut has been connected to Homestead Avenue to provide continuity to the corridor, which is how a decorative area appeared. It is legitimately inviting. Looking back to the east, towards Downtown, you can see the barren commercial zone that we just rode through. The segment has a yellow centerline, but not lane or shoulder markings. The whole road is about 3 lanes wide, 1.5 in each direction, though I have seen people attempt to pass since there is some ambiguity. A couple short blocks to the south is The Hartford’s campus, just over the railroad tracks. 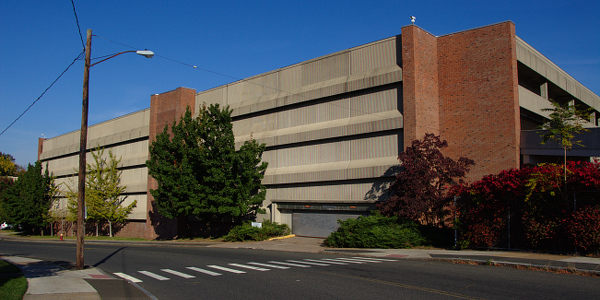 The Hartford even has an enormous parking garage between Walnut and its campus. I don’t know the politics of parking at the company, but if you could score a spot there then you would have a very easy commute from all the neighborhoods and towns to the northwest of the City. But I digress … back to the Walnut/Homestead corridor. Continuing west on Homestead, we find new kinds of buildings on both sides of the street. The south side between Garden and Sigourney is large industrial/commercial sites. There are two vacant buildings and an empty lot. 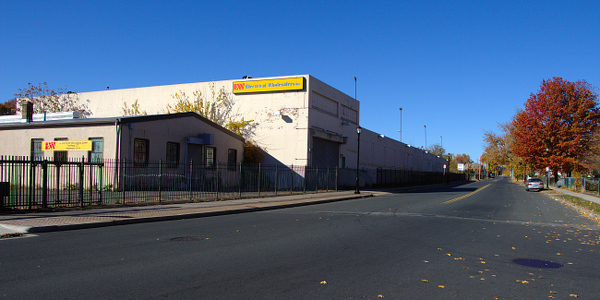 Electrical Wholesalers had quite a lot of space in multiple buildings on the Walnut/Homestead corridor and appears to have recently moved to Ledyard Street in Hartford (down by the airport). The north side of the street has residential buildings. These two are in good shape, others are vacant and in worse condition. That’s pretty much how it goes until the intersection of Sigourney. Here is the view looking back towards Downtown – notice we’re continuing with one-ish lane in each direction and a minimalist approach to striping the road. The intersection of Sigourney and Homestead is unremarkable. The two corner parcels on the south side of the road are vacant lots. One is owned by the City and has a sign up saying it is for sale. 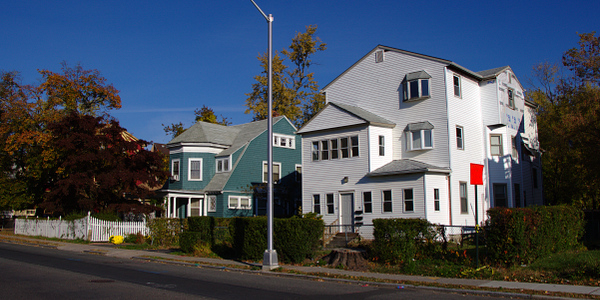 The two corner lots on the north side of the road are homes of a residential multi-family scale. Sigourney takes you directly to the Aetna campus to the south, so again, this route is an opportunity for commuters who work in Asylum Hill. Continuing west, the environment switches to mostly residential uses on both sides of Homestead. The buildings are larger, with three-unit multi-families and larger apartment buildings. Note that the street continues to be unmarked, without even a center line to guide drivers. This segment is a bit of a hill, with these brick buildings lining the street along the way. There are some very handsome properties on this stretch of the neighborhood, which makes up part of a historic district. At the intersection of Homestead and Woodland the character of the street changes again. It goes back to larger buildings, and the road expands to two marked lanes in each direction. The St. Francis Hospital campus is two blocks south on Woodland. This photo looks west through the intersection. 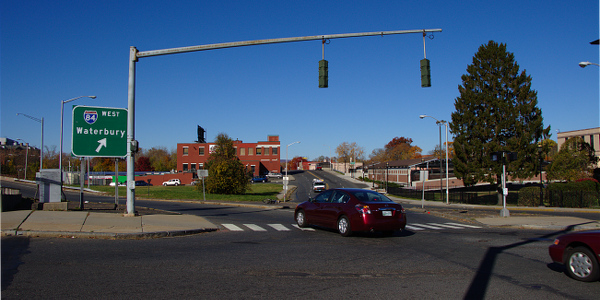 From Woodland Street to the end of Homestead Avenue at Albany, the properties are zoned for commercial uses on both sides of the road. Some are in use, some appear vacant. 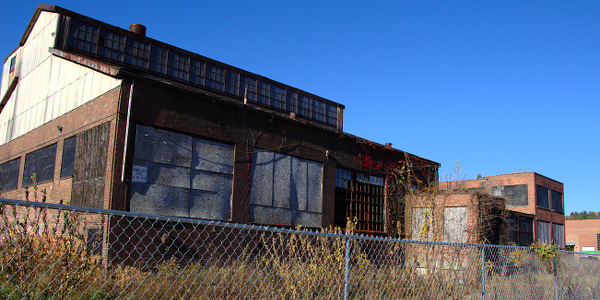 There are blighted buildings and vacant lots. This is a return to the large industrial uses. 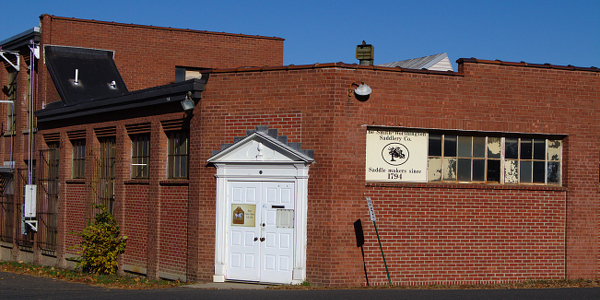 One of the operating businesses right at the intersection is the Smith-Worthington Saddlery, which has been open since 1794. There is a gas station and a car wash across the street from the saddlery that seem to be successful businesses. But as we head west out of the intersection, we begin to see the businesses that didn’t make it. 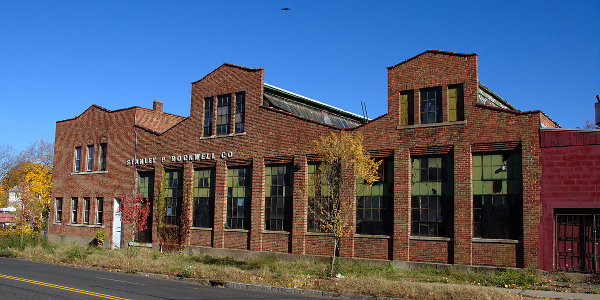 The Stanley P. Rockwell Company had an interesting building when they were still on north side of Homestead. Philbrick-Booth & Spenser had a sprawling compound on the south side of Homestead where they apparently made steel castings. Their insignia can be seen on a building across the street that appears to be in use, so they must have had a campus of their own at one point. There is an abandoned gas station on the north side, along with some other vacant lots that are used for parking. And then there is this interesting looking building on the south side that is fenced off with a sign that says an environmental cleanup is in progress. This stretch of Homestead is not entirely abandoned. The Salvation Army has a big building in good condition. 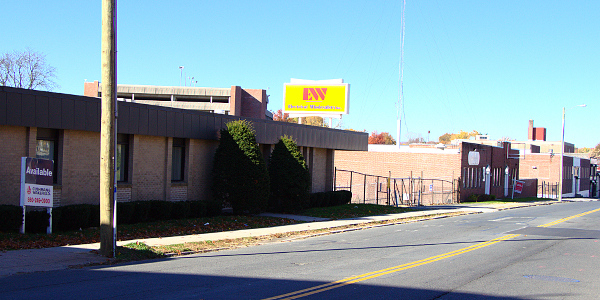 And Interstate Battery also has space in another building. 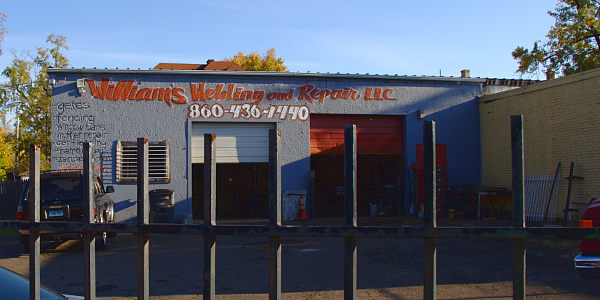 There is a welding shop and a Webster Bank that are both positives bringing up the area. We have just about reached the end of Homestead, where it intersects with Albany Avenue and extends as Westbourne Parkway. 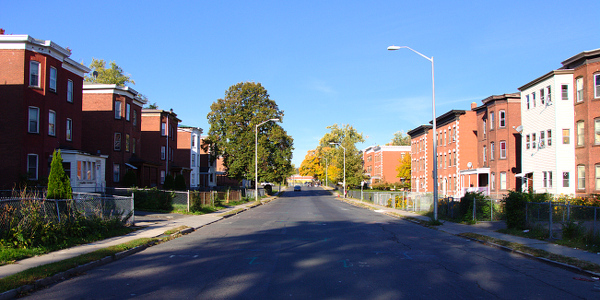 Here is the view of the last block of Homestead looking northwest towards Albany. 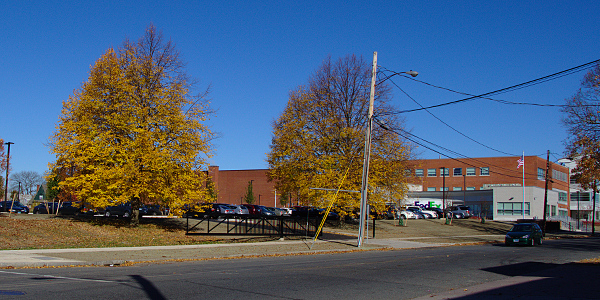 The Hartford Technical Institute was the most recent use of the vacant white building on the right, while the University of Hartford’s new performing arts center is the brick building in the background behind all the cars. The whole Walnut/Homestead corridor follows the rail line, which is still active. This particular train appeared to be pulling empty cars and travelling incredibly slowly as it made its way towards Union Station. And that concludes our ride down Walnut Street and Homestead Avenue. I see a formerly vibrant commercial corridor that could be active again. I see an underutilized commuter route from the neighborhoods and towns to the northwest of Hartford. I see attractive buildings that are currently not in use. 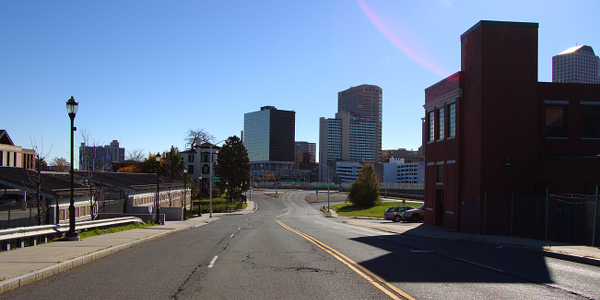 But overall, I see an opportunity for the City of Hartford. More on this to follow. 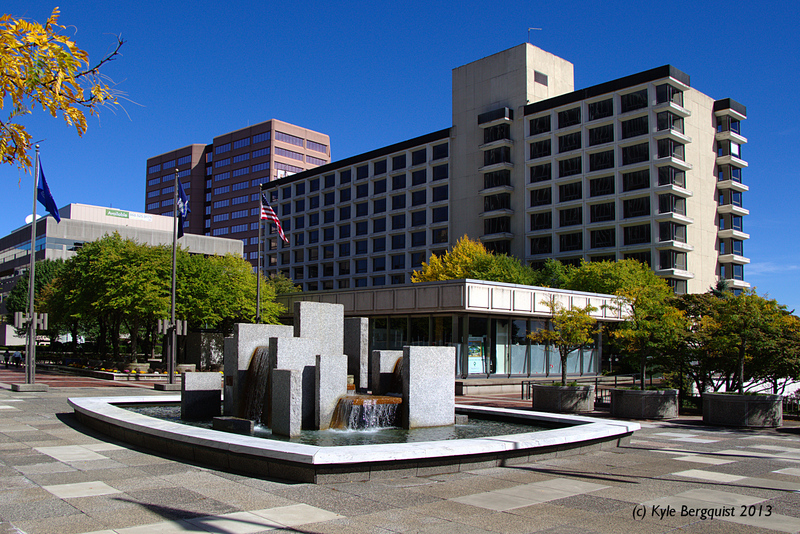 Constitution Plaza is one of the centers of redevelopment in Downtown Hartford. A number of projects have been on the drawing board for years, and recently there seems to be signs that they will begin moving forward. The former hotel in the back right of the photo is slated to become apartments. 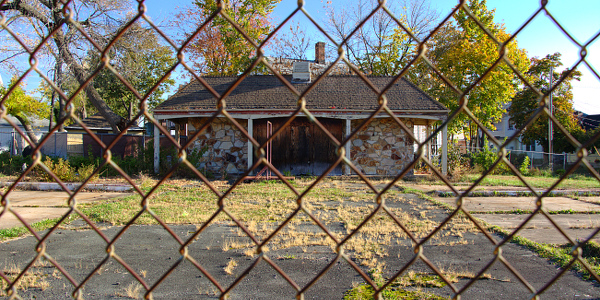 Ken Gosselin, author of the Courant’s CT Property Line blog recently wrote about his encounter with the developer at the site after noticing new fencing. The former restaurant just behind the fountain in the photo is in the process of becoming a TV studio for a new sports network specializing in golf. The Hartford Business Journal published a piece about the status of Back9Network in April 2013 as they continued to build their brand. The CT River Plaza office building in the back left of the photo, along with its companion hidden behind the hotel, have been bought by the State for office space (Note: CT River Plaza is not technically part of Constitution Plaza, but the two are connected by a pedestrian bridge). 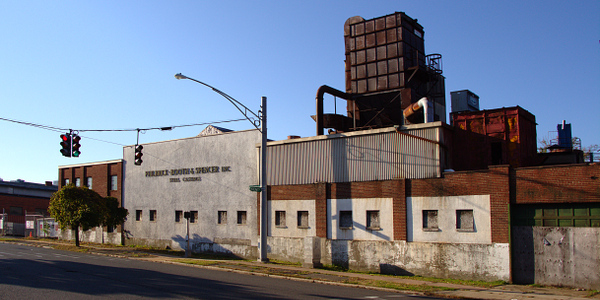 Ken Gosselin reported on the State’s plan to renovate the buildings and have workers on site by 2016. 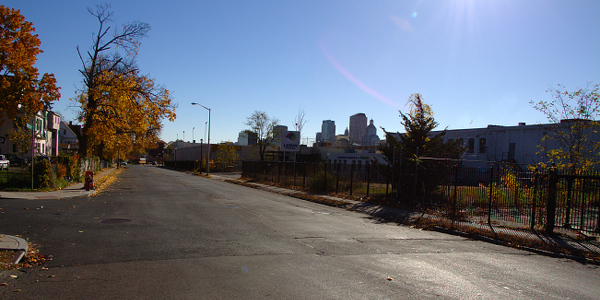 Out of the frame to the right is the former site of the Broadcast House, for which a new apartment tower is proposed. 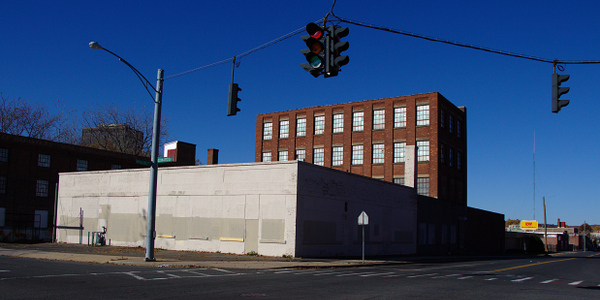 Greg Bordonaro of The Hartford Business Journal covered the announcement about a year ago. The building at the far left of the photo is another candidate for redevelopment, as you can see from the green banner at the top. It was evaluated early on in the UConn discussion, but they eventually selected the Times building on Prospect Street.